I've deployed the components into my sandbox from Visual Studio Code using the "SFDX: Deploy Source to Org" command and I can see that the lighting web components are in the sandbox when I navigate to them in the admin interface (I can't confirm that they exactly match what I'm seeing in Source, but I can see the timestamp of their update is correct). However, neither of them are appearing in the ap builder. I would expect both to appear on a record page app builder and the hellowWorld component only to appear on a home page Lightning Page. Are there general troubleshooting steps I should be taking? 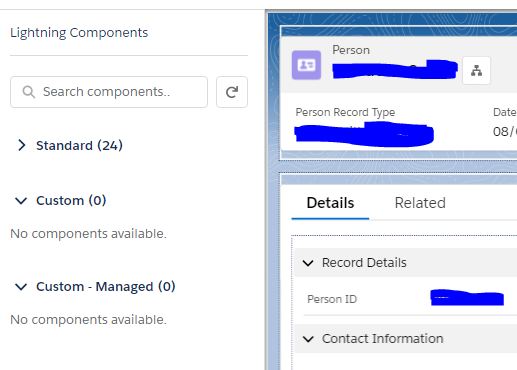 You currently have the isExposed attribute set to false, it needs to be set to true for the component to be available on the targeted pages and app builder. The issue wasn't the deploy, it was me - I'm inexperienced with Visual Studio Code. I wasn't following the correct order of actions. The local save wasn't happening, so I was repeatedly deploying a "blank" component to the server. I've ensured that the local save is happening and the components are now showing up as expected. Not the answer you're looking for? Browse other questions tagged salesforcedx lightning-web-components or ask your own question.